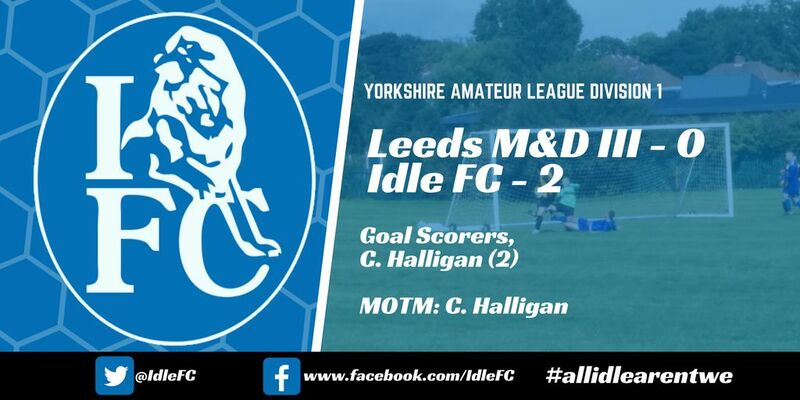 Idle travelled to Leeds this weekend to face Leeds Medics & Dentist’s III who had previously taken a point from the Bradford side in the reverse fixture earlier in the season. That match had been a game of staunch defending and Leeds managed to hold out for a draw despite Idle’s complete dominance of the game. Hopefully, it would be a different outcome this time with Idle looking to secure another valuable three points in the title race. The weather had once again cause chaos across the league with several fixtures already postponed but a 4G pitch at Westwood Sports Park came to the rescue of Leeds and Idle. Idle started strongly and immediately took control of the game, dominating the ball and moving it around the pitch with ease. Patience would certainly be a virtue for the away side with Leeds defending deep once again and looking to restrict Idle’s shooting opportunities at the cost of their own attacking threat. It was mostly one-way traffic with Idle creating several guilt-edged chances through Aaron Irving, Ryan Mitchell and Jack Strudwick. Mitchell had a couple of good runs early on where he decimated most of the Leeds midfield and defence before the keeper came to the rescue and prevent Idle taking the lead. J. Strudwick was also denied by the Leeds keeper as chances went begging. However, Idle were in full control of the game and creating chances. The interplay between midfield and attack was lovely to watch with Adam Medley running riot down the left flank and causing the full-back all manner of issues. Tom Simonett and Carl Dawson had time on the ball in the middle of the pitch and Irving was working hard up-front to create space and link play. The breakthrough eventually came midway through the first half as J. Strudwick delivered a corner from the left-hand side which found Conor Halligan unmarked in the middle of the 6-yard box. The defender eventually swept the ball home after a bit of pinball between the defenders to put Idle into the lead. 0-1. Idle continued to control the game and create chances with Leeds offering very little in reply other than a few pot-shots from distance and a free-kick which Idle didn’t deal with effectively. The half-time whistle came with the away side in the lead. It was a sloppy start to the second half for Idle who conceded possession too easily were in danger of losing their grip on the game thanks to their own stupidity more than anything. This period of disarray lead to the Idle keeper, Marcus Strudwick losing his head with the referee and picking up a booking for his troubles. Irving had dribbled the ball into the box and was taken down by the defender following a clash of legs but the referee didn’t give the penalty. Strudwick then launched a tirade of abuse at the official who had made a clear error not awarding the penalty, however, the referee then thought it wise to stop the game, book M. Strudwick for dissent and award an indirect free-kick to Leeds on the edge of the Idle box despite the ball being in play down in the opposite box. A clear lack of understanding of the rules from the referee who has previous with Idle in the game against Rothwell. Fortunately, the free-kick was sent high over the bar and into the pitches behind the goal. At this point M. Strudwick’s head had rolled completely off, not just with the referee but with the equipment and anything else that took his fancy. Whether it was flat match balls, the health and safety implications of using traffic cones for corner flags, you name it, he complained about it… He was cruising for a second yellow and a red card at this point. Idle managed to regain control and composure of the game and began playing football. The passing and movement in midfield was sublime at times and Idle were cutting through the defensive lines at will. However, the Leeds keeper was having a stormer between the sticks and managed to smother every one-on-one chance he had to deal with. It was another J. Strudwick set-piece which eventually saw Idle double their lead and it was Halligan again who rose highest at the far post to head home. Halligan, who only joined Idle this season has now doubled Jamie Allen’s entire goal tally for the blues in one game…. 0-2 and Idle were cruising now. The Idle defence clearly wanted to secure the clean sheet and defended strongly when required, limiting the Leeds attack to shots from distance if any shots at all. Idle played out the game with ease, coasting to a 0-2 victory and in truth, had it not been for the Leeds keeper it could have been much higher winning margin. Another important three points on the board nonetheless! ← Match report: Rothwell 1 – 2 Idle FC. Determination, desire and DE-fence!